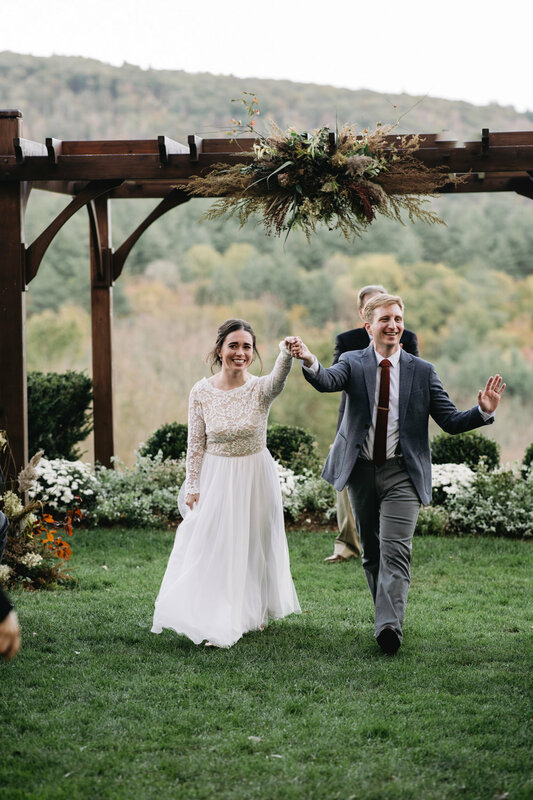 Family is most important to Crystal & Rob, so they wanted a cozy & comfortable get-together in place where they could all enjoy the beautiful autumn of New England. They went with the Pavilion on Crystal Lake, and even though November had already started, it was the most colorful day for fall foliage all year! The weather held out for their “first look” on the lawn and some portraits around the property. Then came the rain, which meant a cozy indoor ceremony lit by a wall of decorative lights, and dramatic rain portraits later into the evening. The cider donuts & cigar station added some fun and personal flair to the rustic elegance Crystal Lake is so well known for. Congratulations to Crystal & Rob, and thank you so much for having us be a part of your day! 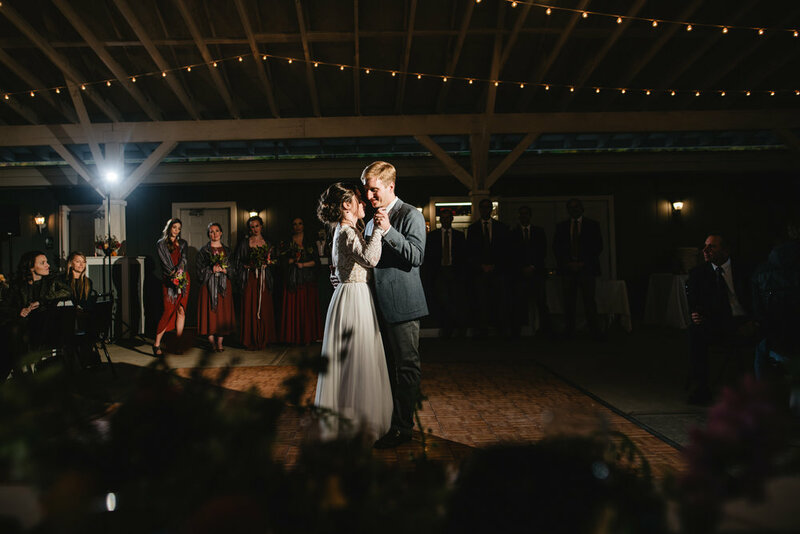 When Jess & Josh reached out and described a movie-inspired wedding at a castle built from repurposed historical architecture by a guy named Bill in the 1960’s, we were SO. IN. First I’ll describe the place. Bill Miller’s Castle was originally a barn that he built into a residence, eventually resembling a Tudoresque mansion that he kept adding to it until it “became a castle.” The ceilings are reclaimed wood from old tobacco barns in South Windsor. The lamp posts on the deck and inside the penthouse “were found laying on the side of old Merritt Parkway.” The stained glass and gates are from Yale. The chandeliers are from the old Taft Hotel in New Haven. The railings are from the Providence Opera House. It goes on and on. The bigger rooms evolved from a gymnastics and dance studio to “Connecticut’s first discotheque” to the event facility that it is today, owned and operated by Bill’s daughter Lisa, who happily gave us a tour and made us feel at home. We came to learn what a distinctive, well-known part of Connecticut this place is; an unofficial museum of New England and an intriguing legacy to a fascinating man. As Lisa was showing us around I imagined that playing hide-and-seek in her family must have been epic. What we will remember most, however, was the way Jess and Josh truly made the event their own and soaked up every minute of the fun and love surrounding them. They took so many opportunities to sprinkle in the things they love: Futurama was referenced in the title of the event (“Shut Up and Take My Vows”), the centerpieces were handmade lanterns each designed around a specific movie favorite (Matt wanted to take home the John Wick), the place cards were Hollywood movie clappers, and the dessert table was inspired by Twin Peaks. A cardboard cutout of their cat made its way from the gift table to the cake, and instead of a guestbook their friends and family signed a movie poster. Toward the end of the night the weather gave us some drizzly movie drama, so they agreed to bring the dance party outside for some quick portraits in the rain just outside the castle’s massive gates. Congratulations to Jess and Josh- thank you for offering your movie wisdom, and we hope to nerd out with you for a game night some day! We met Zora and Scott at Jill & Jeff’s wedding, and we met Jill & Jeff through our best videographer bud Matt Forcier. So we already had a feeling this day would be filled with great people and a whole lot of fun, and we were so right! When Scott & Zora told us about their venue, they described beautiful scenery, a comfortable rustic setting, and Zora was particularly excited about the alpacas (scroll down for some alpaca portraits!). When we arrived, it was even better than we expected and couldn’t believe we hadn’t known about it before, being local to this part of Massachusetts. They wanted to keep it somewhat casual and add some personal touches with a lot of fun. They totally pulled it off: when their friends & family arrived they were surprised to discover that each centerpiece was a framed photo of a dog (complete with the dog’s name displayed) belonging to one of their guests. Zora & Scott’s own dog Sophie was present for the day, and we actually captured a cloud formation that showed up just above their heads in Sophie’s perfect likeness. Their guest book was a nod to their love of fly fishing, and before it was signed we took a “ring shot” on the page with Zora’s favorite fish. We also had a lot of fun with the Viking horn mugs the groomsmen carried around all day, such a perfect compliment to the rolling hillsides and the way Zora and Scott don’t take themselves too seriously! We were also impressed with the level of DIY: Scott cut, stained and built each of the wooden signs, built their card box and up-cycled/refinished another little wooden box for their rings. The "wedding wish*" cards were made from index cards- a joke on how many index cards they have in their house as a result of Scott's 9 years of exam-taking to become an actuary (“*Leave us a note, your best joke or a math problem. We’ll open one year from today!”) They added color to the cards with leaf stamps, tying in with the pumpkins and pinecones found throughout the rest of the decor. We could go on and on but most importantly, we were blown away by our warm welcome, how great Scott Zora treated us and made us feel like part of the family. Thank you so much Zora and Scott and congrats to you and Sophie!! This is an excerpt from the ceremony written and carried out by Amanda’s cousin Bethany, and a great way to introduce the mood of their day. We knew Amanda from working at the same portrait studio years ago. I like to think that when I invited her and Adam out to Western Mass for a “couples session” on a fall day two years ago, I got them thinking more about making their love official… and I was thrilled to find out the next year that he had proposed! Amanda came to me last summer for a rewilding session, and in the time we’ve spent together we’ve connected on so many levels. By the time her wedding came around I was so excited to be a part of this day. They went with a rustic fall theme at Hyland Orchard & Brewery- where we got married 10 years ago in August- and read their vows to each other in private, among the apple trees right after their “first look.” The Flower Shop provided all florals, including a set of stunning and unique hair combs for Amanda and her bridesmaids. Amanda & Adam originally met on Match.com. Amanda “winked” at Adam but didn’t get a reply, so a few days later she “winked” again. Days and days went by… still nothing. So she winked again. Still, there were crickets. Unwilling to give up this chance, she sent him a message and he finally responded. Congratulations Adam & Amanda, and thank you so much for having us be a part of your day! We had a blast walking around Olivia and Kate’s neighborhood in Brooklyn for their engagement session last year, so we were super excited to meet them on the coast of Maine for their wedding ceremony overlooking the harbor followed by a “game night” reception with lots of dancing and tacos! Kate is also a wedding photographer and Olivia works in theater, so the whole day was full of color, drama, creative inspiration and personal charm. They started playing board games early on in their relationship, so they used that as inspiration for a personal touch to their romantic fall getaway. They filled a table at their reception space with games for guests to play. Olivia used a “Clue” card as a pocket square, and almost all of their decor was DIY involving game pieces and something gold. Kate’s streak of teal hair matched Olivia’s tie perfectly (we still have no idea how they pulled that off!) and something told me the color pink would make an appearance. I was right: Kate’s sparkly dress had a hint of pink, and just as we had hoped, we got a glorious pink sunset just as we were wrapping up photos by the harbor. It was a chilly day but Kate had cozy wool shawls for herself and her bridesmaids, which looked perfect against a backdrop of sailboats. She also brought her leather jacket and a puffy coat for their dog Ping! Fairy lights and a big confetti moment at the end of the night added sparkle & surprise, making the whole night feel like magic. Congrats to Kate, Olivia and Ping! Thank you so much for choosing us to capture your big day! 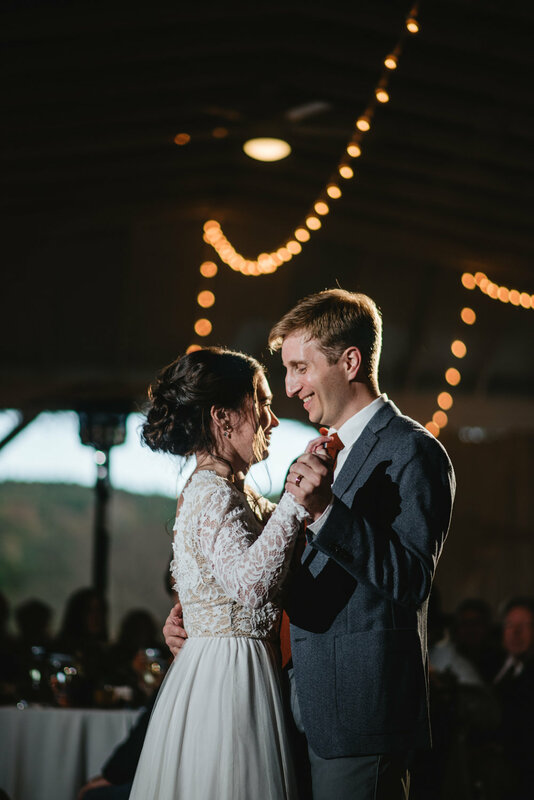 To get all the feels in motion, check out their wedding video by Novae Film & Photo here!